The Coquimbo Notebook takes its name from the port town of Coquimbo in Chile. The notebook begins where the St. Fe Notebook left off in late April 1835, when Darwin was in Valparaiso about to trek northwards up the coast to Coquimbo, a port city in Chile. It has the distinction of being one of only two of the field notebooks which were lent by Francis Darwin for the 1909 centenary exhibition at the British Museum (Natural History), the other being the Santiago Notebook (see Harmer and Ridewood 1909, p. 11). At about 11,500 words the Coquimbo Notebook is the second longest notebook. Although it is only half the length of the St. Fe Notebook, which is by far the longest of all the notebooks, the Coquimbo Notebook is slightly longer than the Falkland Notebook. Curiously, the last five notebooks of the voyage (Galapagos, Coquimbo, Copiapo, Despoblado and Sydney Notebooks) get steadily shorter and shorter, with the Sydney Notebook being the shortest of all. It should be born in mind that Darwin was also using the Red Notebook while using the Despoblado and Sydney Notebooks and this may partly explain why these notebooks are so short. The last five notebooks, like Valparaiso, are all of Type 5. The Galapagos, Coquimbo, Copiapo and Despoblado Notebooks are red, while Valparaiso and the Sydney Notebook are black. The Coquimbo Notebook can be seen in the photograph of several of the Down House manuscripts in Tort 2000, pp. 58-59. It is shown on the left, propped up on top of the Santiago Notebook. For some reason Darwin glued the label of the Coquimbo Notebook onto the back cover. The Coquimbo Notebook is entirely written in pencil and contains about sixteen geological diagrams. Some of these are drawn with exceptional neatness and some are unusually complex, such as the one on p. 27. There are 136 pages, of which the last four are excised. The Coquimbo Notebook was used continuously from 27 April to 26 May after which it was not used again. The Copiapò Notebook replaced the Coquimbo Notebook after a few days break for June 1835, then the Despoblado Notebook was used for July, with the Galapagos Notebook for August to November when the Beagle finally left South America after three and a half years to cross the Pacific and complete her circumnavigation. The notebook traces the first part of what Barlow 1933 called Darwin’s ‘expedition no. 8’, from Valparaiso 600km northwards through Chile to Copiapó. The second part of the expedition is covered in the Copiapò Notebook. The Coquimbo Notebook is the only notebook to provide a direct report of an earthquake, this being the one of 22 May recorded on p. 99, the time of which Darwin jotted in the inside back cover as 8.00 to 8.15pm. Darwin himself did not feel much motion, but the noise caused great consternation at the house where he was dining at the time. I am tired of this eternal rambling, without any rest. — Oh what a delightful reflection it is that we are now on our road to England.— My method of travelling is very independent & in this respect as pleasant as possible. I take my bed & a Kettle, & a pot, a plate & basin. We buy food and cook for ourselves, always bivouacing in the open air, at some little distance from the house, where we buy Corn & grass for the horses. — It is impossible to sleep in the houses, on account of the fleas (Correspondence vol. 1, p. 449). The notebook contains detailed observations of the famous Coquimbo terraces, visited by Darwin on 19 May. These had been discussed by Lyell in the third volume of his Principles and Darwin must have been eager to see them for at least the previous year, since reading Lyell’s book. Lyell doubted the explanation for the terraces given by Hall 1821 who saw them as the shores of lakes, and Lyell suggested that uplifted sea beaches seemed more likely. Darwin’s discoveries of marine shells demonstrated to him that the terraces were indeed uplifted sea beaches, this being clear proof of his by now mature view of South America as a continent rising from the ocean. Darwin discussed these terraces at length in South America, pp. 39-44, where he several times referred to his own identical 1839 explanation for the Parallel Roads of Glen Roy in Scotland (Darwin 1839). Darwin’s work at Glen Roy was probably the most important piece of geological fieldwork that he carried out after the voyage and he was very reluctant to give up his sea beach theory for their origin, even after most geologists had accepted a glacier lake theory. This paper was a great failure, and I am ashamed of it. Having been deeply impressed with what I had seen of the elevation of the land in S. America, I attributed the parallel lines to the action of the sea; but I had to give up this view when Agassiz propounded his glacier-lake theory. Because no other explanation was possible under our then state of knowledge, I argued in favour of sea-action; and my error has been a good lesson to me never to trust in science to the principle of exclusion. By 1861 the Scottish case had been shown conclusively to have been nothing to do with Darwin’s theory of crustal elevation, but ironically to have had much more to do with Hall’s explanation for the Coquimbo case (see Rudwick 1974, p. 114 et seq. and introduction to the Santiago Notebook). Darwin did not take the opportunity in the second edition of South America to correct the statements he had made about Glen Roy in the first edition of 1846. The Coquimbo Notebook opens on Monday 27 April 1835 with ‘Started from Valparaiso: farewell look smokeless — (perfumed) red — bare hills — picturesque’, p. 1. It is clear from the Beagle diary that Darwin was travelling with the trusty Mariano Gonzales, four horses and two mules and Journal of researches, p. 416, that all the animals cost just £25. The country was ‘so brown & bare’ that Darwin compared it to the Cape Verde Islands he had visited three years previously. The following day Darwin ‘passed Limanche & Umiri’ and took a detour to the foot of the Bell Mountain [Cerro La Campana] which he had climbed in 1834. He immediately plunged into detailed descriptions of the granites, gneisses, porphyries and other rocks which he eventually published in South America, pp. 169-175 . He was especially interested in the metalliferous rocks which were the big attraction of Chile to European mining engineers and adventurers. He ‘Lodged at Chacia — ugly people as most Chilenos’, p. 3, and the next day had a short ride to Quillota where he was struck by the high price of corn and the poverty of the natives. On 29 April there was ‘very light shower during the last night’, p. 4, the first rain Darwin had experienced since being pinned down at Cauquenes seven and a half months before (see introduction to the Santiago Notebook). On the following day he thought the new snow on the distant Cordillera might have been ‘perhaps most beautiful view I have seen in Chili’ and he noted the ‘immense quantities of broken shells’ on the hills, p. 5. On Friday 1 May Darwin noted the valley terraces of pebbles and shells ‘said by Guasco (in all parts of valley) to be "Diluvium"’ but the quote marks show how Darwin had by now abandoned this term for such obviously marine deposits, even though they were ‘1 & ½ league from sea’, p. 7. These deposits were described in South America, p. 35. The next day Darwin examined the slates and sandstones exposed on the beach where there were ‘roaring Breakers’ and the trees had been replaced by a Yucca-like plant, p. 11. Geologizing continued on the 3rd, on the road from ‘Quilimar to Conchalee’. The 'immense quantities of large Concholepas = Venus & Donax’ mollusc shells put ‘question beyond doubt if there had been any: great sea in Chili’, p. 15. The climate was ‘much drier here than in Valparaiso’ and Darwin was amused that everyone had heard of the Beagle and ‘all think’ she must be a smuggler! The expedition continued on to the copper mining town of Illapel which was about the half way point to Coquimbo. On the way Darwin was struck by the stark contrast between the green ‘Alfarfa fields’ and the brown hills above, and on arriving in Illapel he found the Governor to be an ‘extraordinary arbitrary character’, p. 18. They ‘Staid at Illapel whole day [to] rest animals’ and just as at home in May summer would be starting they had to bivouac against a ‘cloudy gloomy windy day — leaves falling. Winter — Oh the difference with England!’, p. 20. From Illapel Darwin struck inland on the 6th to Los Hornos to investigate the mining district. He crossed the north-south line separating the granite from the porphyritic breccia derived from it, and came upon a group of miners carrying a dead companion for burial. Each miner wore a ‘small Scarlet cap — extraordinary wide trousers. — & officers broad parti-coloured belt’. Four men ran carrying the body while the other four galloped ahead on horseback so they would be fresh to carry the body when the runners caught up. ‘Such a funeral’ wrote Darwin. These miners, he noted, were ‘remarkably brown’ and they were ‘like Sailors in extravagance’, pp. 24-25. By 7 May Darwin’s highly varied rock collection for this expedition was growing steadily, reaching specimen number ‘(24) Gold ore’, p. 26. The whole of the next page is taken up with a complex map showing how the mines seemed to be concentrated in a NW-SE trending band of Tertiary ‘gypseous formation’ of immense thickness, with breccia on both sides. This was followed by page after page of geological description, including notes of large, silicified, metalliferous fossil trees, p. 36, which Robert Brown subsequently identified as coniferous (South America, p. 209. Some of the hills were so ‘drilled through’ with mines as to seem ‘like bank with Rabbits’, p. 45. This had been a red letter day of ‘interesting Geology’ and ‘Very hot the sun although now winter’. That night Darwin ‘dined in little Rancho mining hut — good dinner, pumpkin bean….pepper grease, onions — roasted Pumpkin’, p. 47. He continued collecting the next day but as he approached the ‘pretty looking town’ of Combarbalá he was surprised to find that ‘there are no mines! !’, p. 55. This is the narrowest part of Chile, the border with Argentina being only 80km from the sea. On 9 May Darwin continued on his rather wearisome way to Punitague [Punitaquí]. This was a ‘Stupid day — barren like turnpike road — wheatfields in valley — curiously stony’, p. 59. The 10th continued in a similar vein, but on the 11th Darwin was able to visit Alexander Caldcleugh’s copper mines at Panuncillo. The notebooks do not suggest that Darwin actually went far inside any of these or any other mines in Chile. He did, however, witness there the extraordinary feats of labour performed in the mines by the ‘Apires’ with their ‘breath like fire; odd noises stream of perspiration of breast’. They had ‘no meat, no diseases’ and laughed at Darwin’s puny ‘25 pound hammer’, p. 65. Darwin could barely lift off the ground the 200lb (c 90kg) loads these men carried up near vertical notched poles twelve times each day. The Mayor-domo of the mines was Don Joachin Edwards, described by Darwin on p. 75 as ‘young ½ Chilean & English’. He recalled to Darwin that as a boy in Coquimbo he had been taken to see a visiting English sea captain and such was the dread of the English buccaneers that he had been terrified of ‘contamination sticking to him’, p. 76. Darwin stayed at the mines for three days, leaving on the 14th for ‘Herradura bay South of Coquimbo’, where he found all hands from the Beagle living in tents while the ship was refitting for her long passage across the Pacific. Darwin was able to find partially silicified whale bones and large quantities of shells, p. 85. He had collected at least fifty-eight geological specimens and was no doubt relieved to offload these onto the Beagle. Darwin spent the 15 May on board, then on the 16th ‘with Capt. FitzRoy’ (as is stated in the Beagle diary) he took lodgings in Coquimbo. Keynes 1979, pp. 280-1, reproduced a remarkably atmospheric watercolour of Coquimbo by FitzRoy, dated 'May 25th 1835'. On the 18th Darwin examined the plain behind the town and drew a sketch map of the bay with two ships at anchor, one of which was presumably the Beagle. He found numerous marine shells at various heights and was certain the plains were marine terraces. Darwin ridiculed Basil Hall’s lake hypothesis: ‘How could B Hall fail to see the plains curling out to seaward?’, p. 93. No. 10. — NORTH AND SOUTH SECTION ACROSS THE VALLEY OF COQUIMBO. "Vertical scale 1/10th of inch to 100 feet: horizontal scale much contracted: terraces marked with (?) do not occur on that side of the valley, and are introduced only to make the diagram more intelligible. A river and bottom-plain of valley; C E and F, on the south side of valley, are respectively, 197, 377, and 420 feet above the level of the sea." An idealised north-south section through the terraces in the Coquimbo Valley, approximately 5 km from the sea. The section is approximately 1.7 km across and shows the five main terraces of shingle and sand, of which B, C and F are the most conspicuous. Fig. 10 from South America, p. 40. According to the Beagle diary on the evening of the 18th Darwin dined with ‘Mr Edwards’, but it is unclear whether this was Joaquim or the José Maria Edwards with whom Darwin visited the young man’s father’s Arqueros silver mine a few days later. It was during this dinner that Darwin experienced the ‘smart shock of an Earthquake’. This does not, however, tally with the notebook where the earthquake is described at the end of the entry for the 20th: 'Earthquake, screams of women great roar — little motion — called severe — appalled the men', p. 99. This entry, taken together with the dated entry on the inside back cover, seems to demonstrate that the 20th is the correct date for the earthquake and that the Beagle diary is misleading. The next day (the 21st) Darwin set off across ‘mountainous grand alpine country’, p. 101, with Don José and arrived at the mine after dark. Darwin recorded in the Beagle diary the pleasure of sleeping that night derived from the absence of fleas above 1,000m. He was, however, puzzled at this absence as the small temperature difference did not seem an adequate explanation. The 22nd was an opportunity to collect specimens and to record the geology in detail, much of which was published in the final chapter of South America. The green rock has in one case to the distance of a yard from the side of the argentiferous vein [been del.] had its particles cemented by native on the Horn Silver — the variety is exceedingly beautiful & the circumstance considered rare. I have a specimen of one of these green rocks, with the usual granules of white calcareous spar and red oxide of iron, abounding with disseminated particles of glittering native and muriate of silver, yet taken at the distance of one yard from any vein, — a circumstance, as I was assured, of very rare occurrence. Alfred Harker took a thin section of 2940 (see his manuscript catalogue on Darwin Online here) for petrographic analysis. He numbered the section as 47194 and labelled it ‘Calcareous tuff impregnated with ore’. So 2940 is a remarkable instance of a specimen for which we have the original note and field specimen number, made by Darwin at the site of collection, in Chile on 22 May 1835, then his specimen list entry and geological diary description, followed ultimately by his published account drafted about ten years after collection. The specimen is now receiving the highest quality of curation at Darwin’s alma mater, a short distance from where he unpacked his specimens at the end of the voyage in Cambridge. The notebook contains mention of many other important specimens, such as ‘(70) part of Coral reef’, p. 102), and on p. 107 Darwin noted the presence in the limestone of ‘immense quantities of large oysters & Gryphites’ and other fossils. There is some confusion over dates on p. 109 but it seems that Darwin reached the Hacienda of the Marqueros by the night of the 22nd and left there on the 23rd. He continued to fill the notebook with an extraordinarily dense discussion of the rocks and their complex field relationships, largely as seen from the saddle. On p. 110 he drew a section showing purple porphyritic breccia cut by a fault, and by p. 119 he felt ready to attempt an ‘eye-sketch section’ showing the breccia, limestone, hornstone, syenite, gypsum, conglomerates, clays and lavas, most of which are described in South America. His worked up version of the two combined notebook sections is now in DAR44.21. On the 24th Darwin related how, at the Hacienda of Gualliguasca, the ‘Signorita not 17 mere child mother of two children’ was apparently pregnant again. He adds that she was ‘very pretty — dressed like lady’ but that she was living in ‘Some second rate farm house’, p. 120. The scenery, conversely, was ‘first rate’ and reminded him of pictures of the ‘Alps in the annuals’. The next day Darwin parted from Don José and continued up the valley to where the Rios Claro and Elque met, his specimen tally there reaching 100. He found ‘very great quantities of small white quartz pebbles in the white sandstone ([specimen number] 97); remarkable quantity, first time I ever saw such a thing, ground strewed with Beans — common Belief’, p. 123. He also found some ‘Secondary’ (i.e. Jurassic-Cretaceous) fossils. The numbers of some of these were ‘quite wonderful’, p. 127, and were discussed in South America, pp. 210-13. One of these fossils was the new species of brachiopod named and described with an illustration by Edwards Forbes as Spirifer linguiferoides in South America, p. 267. Spirifer linguiferoides, from the Rio Claro. Plate 5 figs. 17-18 from South America. On 26 May Darwin ‘having seen what I wanted’, as he wrote in the Beagle diary, ‘returned to Coquimbo’, p. 128. On the next page there is an obscure sketch or map which may show the terraces mentioned on p. 130. On the 27th Darwin and Don José were back in Coquimbo where the rain of two weeks previously had produced ‘thin scattered delicate grass. One inch long like hairs.’ There follow four names of key ex-patriots (Douglas, Corfield, Alison, Caldcleugh) and two of Chileans who probably had important information and should be sought out in Copiapó. On p. 131 Darwin reminded himself to repay FitzRoy ‘2 dollars & Rial’. There are some more names, such as Charles Lambert (1793-1876) who provided Darwin with much useful information (see for example Correspondence vol. 1, p. 455) and played a prominent role in the Welsh copper industry (See Alban 1990). The final two leaves are excised, and the inside back cover has jottings relating to the 20 May earthquake; ‘5 more were felt up in the country same night’ and the time of the shock at Coquimbo noted as ‘8 PM to 8.15 (20th) — Wednesday’. ‘What money has been got out of Arkeross’ relates no doubt to the discussion of mine revenues in the Beagle diary for 22 May. The final decipherable jottings are ‘Mar[iano] G[onzales] is paid up to the 15th of May + 20 Rials in Quillota for spurs’. The next notebook, Copiapo, continues from the Coquimbo Notebook on 31 May almost without break and the two notebooks are perhaps closer in content than any other two. Almost the first jotting in the Copiapò Notebook is ‘20 Riales in Quillota’ so is almost identical to the last in the Coquimbo Notebook. The geological notes simply continue from the Coquimbo Notebook into the Copiapò Notebook and then into the first forty-two back pages of the Despoblado Notebook, where the final rock specimen number reaches 185. 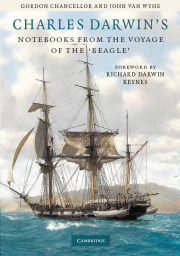 In this way the Coquimbo, Copiapo and Despoblado Notebooks can be thought of as a more or less continuous trilogy of notebooks which took Darwin up to the point where he sailed from Copiapó on 6 July. 1 We are grateful to Francis Neary and Katherine Antoniw, of the Sedgwick Museum of Earth Sciences, for this information and colour photographs of the specimen.